East Dallas is best known for Lower Greenville and Knox/Henderson, popular avenues for drinking, eating, shopping, and nightlife. You’ll see a mix of rocker types, professionals, and families here—and all these folks love their coffee. Hailed as a hotspot of coffee shops, East Dallas is leading the way in trendy cafes, creative coffee concoctions, and cold brews ideal for a hot Dallas day. Whether you’re an amateur who doesn’t know the difference between an Americano and latte, or you’re a coffee obsessive who can’t form a sentence in the mornings without your daily pour-over, here’s a quick tour of East Dallas’ coffee scene. As the name implies, the folks at Toasted love toast. This coffee shop is best known for specialty toasts with a variety of toppings and cute names like “Toast Ma Goats” and “Don’t Get Salty.” They use Noble Coyote Coffee Roasters for brews that range from Nitro Cold Brew to lattes with house-made syrups like lavender and cardamom rose. With high ceilings, exposed ductwork, a glass wall, upstairs and downstairs seating, and trendy hanging lamps, Toasted gives off a cool warehouse vibe on a busy intersection of Ross Avenue and Lower Greenville. 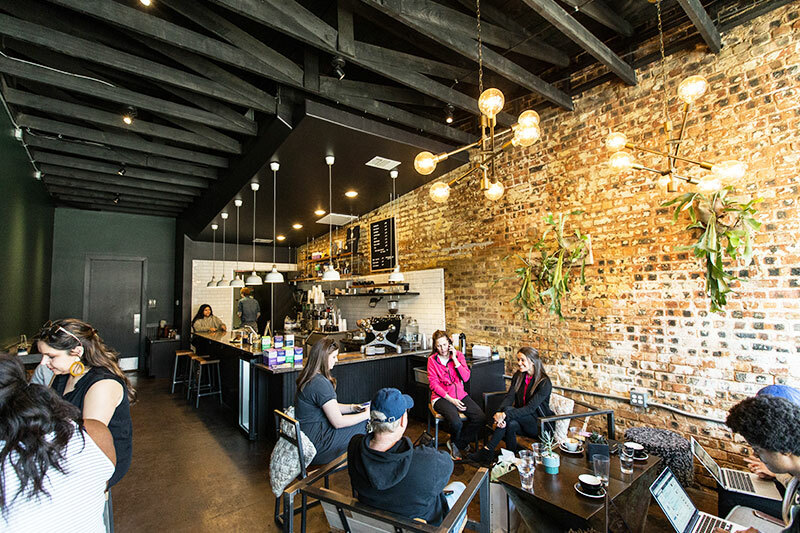 Houndstooth Coffee is a coffee connoisseur destination of East Dallas. Though there are three shops in the city, the Henderson location brings in the most foot traffic. 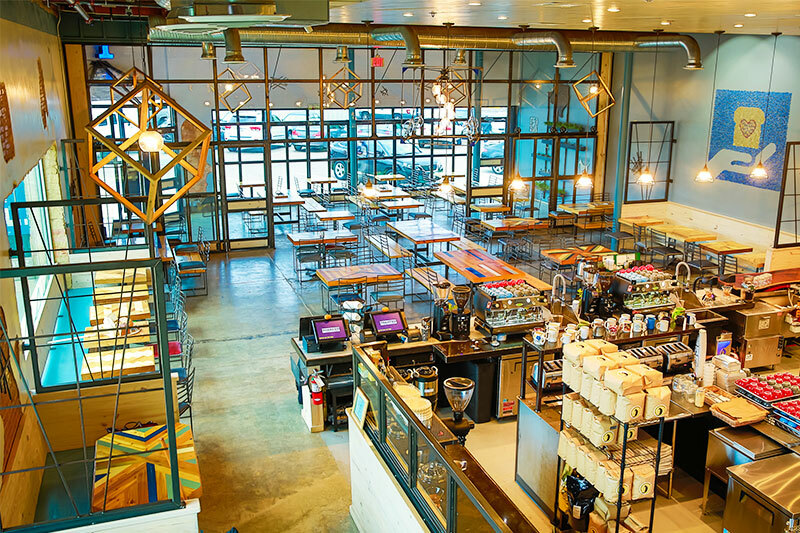 With a sleek setting of white with pops of color and reclaimed wood, this stylish spot primarily focuses on coffee, unlike most coffee shops in Dallas which double as bars. Serving Tweed and Counter Culture Coffee, Houndstooth’s menu offers a wide variety of espressos, macchiatos, lattes, cortados, and Americanos, as well as iced teas and cold brews for those Dallas summers. In the mornings, they also serve Tacodeli breakfast tacos and provide a smattering of pastries throughout the day. The staff here is easygoing and always willing to offer drink suggestions. WIth some exceptional mural art on their outer walls, Fiction Coffee is the newest shop on the scene, replacing now-closed Method Coffee off Ross Avenue. They’re best known for offering Counter Culture coffee with options like multiple non-dairy milks and syrups made in-house. Be sure to ask about their “fictional” menu which is only available upon request. Breakfast tacos from Tacodeli and sweets from Naturally Curly Cook can be enjoyed with a good brew in their attractive but homey environment. Laid-back and cool accurately describes Mudsmith on Lower Greenville. Past the small patio and through the large iron door, visitors enter a space with heavy wood decor and quirky decorative items like stuffed animals and framed artwork. The menu is written in chalk on a chalkboard above the bar, and features a variety of coffee, teas, kombuchas, smoothies, and beers on tap. Their morning flights, two shots of coffee and one shot of orange juice, are especially popular, as are their homemade juices, which also come in shots. The food menu is diverse with sandwiches like the BKT (bacon, kale, and tomato), toasts which include an almond butter rice cake, and breakfast offerings of hash and waffles. Grab a coffee and a snack and head to the comfortable couches or the wooden tables. With closing hours at 11 p.m., there’s no need to rush. Like Houndstooth, Halcyon is an Austin-based chain coffee shop, and it’s located on the northern end of Lower Greenville. This spacious spot is a coffee bar by day and lounge at night. At Halcyon, they up the coffee game with a fantastic menu of creative coffee-based drinks and delicious food. Their Vietnamese coffee or iced Toddy-brewed coffee goes great with a Nutella crepe, and the chocolate espresso martini pairs well with their do-it-yourself s’mores. A flatbread, chicken biscuit sandwich, or nacho tots might be best paired with a smoothie, coffee frappe, or coffee-based cocktails. 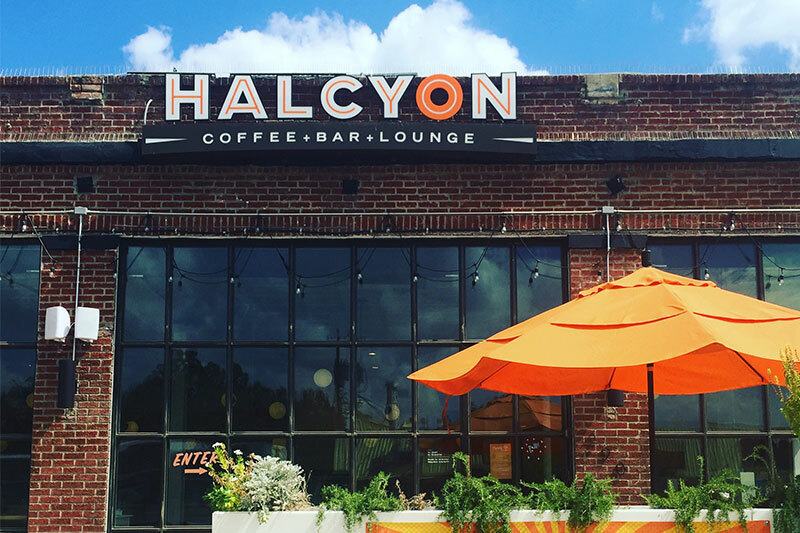 With a name like Halcyon, which means “peaceful, untroubled, and prosperous,” it’s sure to be a carefree coffee experience.